Now while it feels wonderful to receive a gift, especially from someone you love, its really wonderful to give a gift to someone less fortunate than yourself. Helping those in need is part of the commission that Jesus gave us. My wife and I are far from wealthy, but we have chosen to make a monthly donation to the Adventist Disaster Relief Organization (ADRA). Its not a huge donation, but every little bit helps and it makes us feel better that we are helping people in their time of need. Sharing a small portion of our bounty with someone we will never meet is what Jesus wants from us. We do not do this for recognition or to get our names on a plaque, we do it because it just feels right. If everyone thought that way, our world could be a much better place. 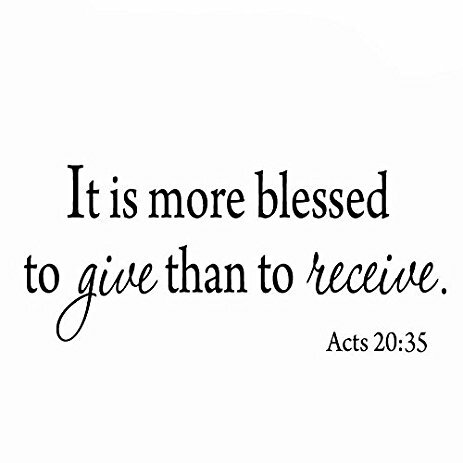 Instead of asking for and receiving the “next big thing”, how about giving a little of yourself to those less fortunate and receiving the reward that will really feel good! Previous Lover not a hater!